Ask fellow campers about "Mikesell Potts Recreation Area" and nearby attractions. I'm sure during the hot summer months, this place is rocking, but mid-September was a great time to visit and was still plenty warm for water activities. As a previous reviewer mentioned, there is a less-obvious campground area accessed by a right turn before you go through the main gate. Be sure to check the whole area before choosing a site! Our site was level, but many, especially the electric sites, appeared to not be although everyone parked in them had managed to get situated just fine. We enjoyed kayaking, biking, and walking while here, and it's a short drive into the sweet downtown of Buffalo for more activities/amenities. Powder River Apiaries is on the way into the campground with a sign out front advertising honey for sale. If you're in need, you can just go in the white door where there is a big selection of honey and a honor-system payment box. We saw lots of wildlife here including pronghorn, turkeys, deer, turtles, and monster lake trout. The winds picked up considerably during our last night, waking us with the noise. We pulled in three of our four slides to keep the overhead canvas from tearing. We camped at Mikesell Potts Recreation Area in a Motorhome. Found this 'county' campground using Allstays app. Great find with stunning views of the lake, mountains, and Wyoming-open skies. A couple of cows greeted us as we entered the campground! :-) Plenty of space on the lake side spots (no services) for our 45' MH and towed, that we didn't have to unhook. We were able to pull thru. The sites are not level, and some have grass, others have gravel or pebble rock. Most sites have a large concrete picnic table. Not many trees for shade, but the temps were in the 70s. There are 8 back-in spaces that do have electricity for $15 and there was an opening that would have accommodated our MH. The roads coming in are decent considering this is snow country. The campground host was available for questions. We would definitely stay here again. We camped at Mikesell Potts Recreation Area in a Motorhome. You'll pass another RV park that has a Motel and Lounge, and campground store. Nice, helpful folks there, too! First come, first serve. Only seven sites have electric, otherwise no hookups. Our site was very, very large and surrounded by shrubs and trees which afforded us much privacy. Other sites along the waterfront are completely open with no utilities. There is one pull through up front near the water. There were vault toilets. Beautiful views for miles of the Bighorn Mountains and the lake. Very popular with the locals. A destination campground. We arrived Saturday night at 7:00 pm and managed to get site #1 the only electric site vacant. We paid the iron ranger. Campground hosts very friendly. Would love to return. We camped at Mikesell Potts Recreation Area in a Motorhome. Arrive with a full tank of water and empty waste tanks. Huge sites. Great views of lake. Concrete picnic table. Firepit. We camped at Mikesell Potts Recreation Area in a Travel Trailer. Sites are not cleaned up after departure. Restroom is an outhouse and horrible. Eight sites have electric, majority of park is dry camping. Sites have a fire ring. Boat launch available and beautiful view of lake. We camped at Mikesell Potts Recreation Area in a Travel Trailer. Close to Buffalo, WY, convenient to I-90. Best primitive campsite I have ever seen. We arrived during the week and got a site alone on top of a small hill overlooking the lake. There were other sites with electricity but closer together. We camped at Mikesell Potts Recreation Area in a Travel Trailer. We stopped here for one night on the way to Yellowstone. It is a county park. There are 6 or 8 back in sites that are not on the water. We just parked on a spot that was pretty level about 20 ft from the water. Beautiful view and nice and peaceful. Dry camping only. Located about 5 miles north of Buffalo and easy to get too. We parked here with a 35ft FW and did not even unhook. Loved it and highly recommend it for a one night stop over. Would stop here again. Not sure how many sites, just guessed. 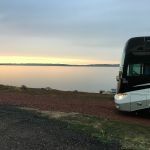 We camped at Mikesell Potts Recreation Area in a Fifth Wheel. True Wyoming experience, the lake is the 'swimming pool'. Fish, boat, dive or just watch from your site. Established sites have fire pits and tables, or you may park anywhere for $6 a night, including the South end of lake. Pit toilets, no showers but very rarely crowded. We camped at Mikesell Potts Recreation Area in a Motorhome. Are you affiliated with Mikesell Potts Recreation Area ?